On the 1st of July of 1841, Charles Millen a warden of the Cinque Ports pilots, was impatiently waiting for some Dover shipwrights to finish rigging and caulking the cutter Gem, newly built that year. Groups of Cinque Ports pilots periodically made local survey voyages to familiarise or reacquaint themselves with the very extensive area they worked in. There appears to have been a survey in 1832, and another in 1851. 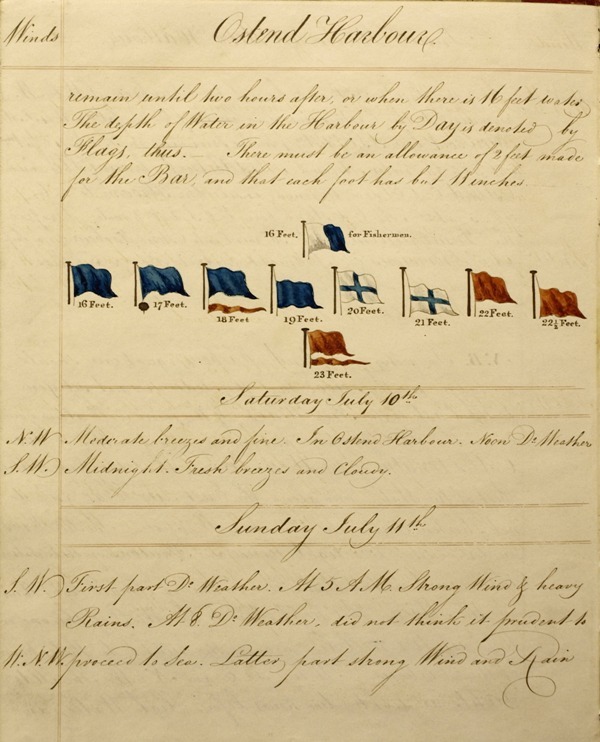 A complete record of the 1841 survey is in the Kent County archives: a manuscript book of about 60 pages, it is essentially a copy of the daily log with details of courses and soundings on specific bearings to coastal marks, positions of buoys, occasional sailing directions, and some coastal views and harbour signals. 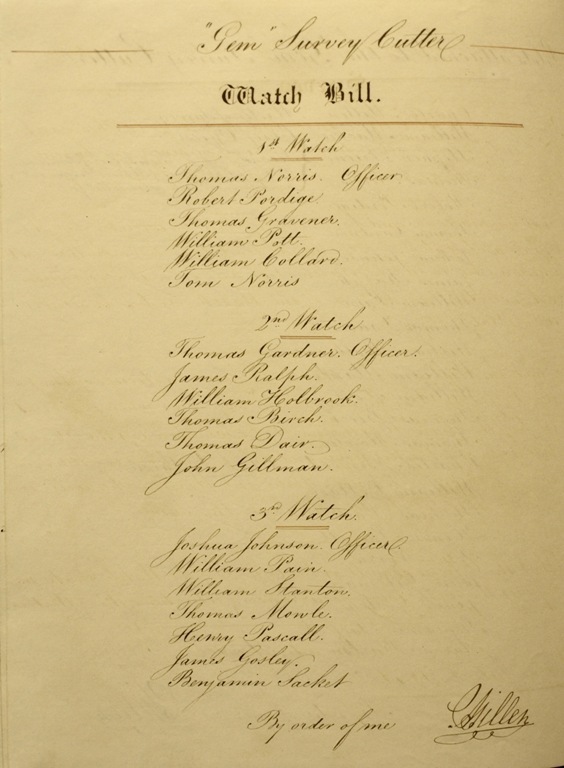 On the title page of the manuscript the pilots are listed in order of admittance, with their duties. Millen was to be assisted by a chief officer William Mackie, and a second officer, Stephen Friend who was responsible for all provisions, water, sails and stores. Two other pilots had special duties to perform. Charles Norwood was clerk to the survey, and I assume that it is his clear handwriting which records events in detail. Aaron Burton, the junior pilot based in Margate, was steward during the voyage. The remaining crew were pilots aged between 27 and 43 years, those most recently admitted as pilots in the period from 1831. All were based at Deal with the sole exception of Benjamin Sackett from Ramsgate. On this occasion roughly one third of the Deal pilots were to be away from their normal duties for over a month. Millen's watch bill was accompanied by regulations on how the survey should be conducted. Watch keepers were to sound continuously in shallow water with the hand lead, rotating every half hour, and sound with the deep sea lead every half hour when the depth of water was over 10 fathoms (60ft, 18 metres). The log slate was used to record course, distance run and wind direction. The results were then copied into the survey report. The Gem was a cutter of about 30 tons, 44 ft in length and 14 ft in the beam, and smaller than the usual Deal and Dover pilot cutters in the range of 70-90 tons, that cruised off Dungeness waiting for ships coming up channel. Cutters generally have a flexible rig, and sail plan, with a sliding bowsprit, and are easily handled in all weathers by few hands. The Gem was built in May 1841 by James Duke, a prominent Dover shipbuilder and owner. She was apparently chartered for this voyage, and was not sold by Duke until 1867. The Gem sailed on July 3rd passing Dungeness, Beachy Head and reaching Spithead on the 6th. Returning up channel, they met the Argus cutter from Deal which was cruising off Dungeness, ready to put pilots aboard vessels sailing eastwards. After taking on water and coals from the Argus, the survey continued on the Varne and Calais banks, and was at Dunkirk Roads by the 9th of July. There the pilots learned of the construction of new lighthouses at Dunkirk and Gravelines. At Ostend, while the Gem was in harbour for a few days, several members of the crew took a sightseeing trip to Brussels by the new railway, according to the journal of William Stanton. Altogether the pilots spent a week or more on the Dutch coast before sailing for Yarmouth on July 20th. On this leg of the voyage a broken mast hoop had to be replaced by a temporary strap made from one of the ships mooring warps. The Gem made Yarmouth Roads by noon on the 22nd. Charles Millen explained his reasons for spending several days around Yarmouth and Harwich, normally the province for local pilots, ‘which place I consider requisite to be surveyed by all Cinque Ports pilots in case of being blown away in the winter season’. The survey manuscript contains many coastal views and drawings. An interesting detail is from the harbour at Ostend, showing the flags for depths of water on the fishing dock. At Sheerness a boat was sent ashore with James Gosley having ‘jammed his finger with the anchor, and received a certificate from the surgeon his incapacity of going the remainder of the survey’. By August 3rd, the Gem was back in the Downs to put stores ashore, and on the 4th return to Dover, and Millen reported on the survey the following day with a letter to Henry Smart the Deputy Lieutenant of Dover Castle. Journal of a survey of the Cinque Ports Admiralty made by Deal pilots in 1841. Images from the survey are reproduced with permission of Kent Archives [CPw/LZ/1 Miscellaneous].